Wiping out student loan debt in bankruptcy is so difficult it’s rarely an option for distressed borrowers. But there are indications that bankruptcy courts are starting to play a bigger role in addressing what is widely considered a financial crisis and a drag on the U.S. economy. While not aiming to discharge debt, about two dozen bankruptcy jurisdictions allow debtors to participate in programs that cap repayments based on income. And attorneys are having anecdotal success in negotiating with the government to get more debtors into these repayment plans even when they are in bankruptcy. Although borrowers in these types of plans may have lower default rates, according to one consumer agency, they, too, come with caveats in bankruptcy. Some debtors, in the end, may not be that much better off as interest on their loan piles up. Right now, though, it’s called progress for those helped by restructuring student debt obligations in court. “We can’t count on Congress to change the bankruptcy laws, so right now we have to rely on non-statutory changes,” said Boltz, former president of the National Association of Consumer Bankruptcy Attorneys. About 44 million Americans hold student loans totaling more than $1.4 trillion, most of it from federal sources, according to the Consumer Financial Protection Bureau. Student loans are second to mortgages and ahead of credit cards and auto loans in household consumer debt rankings, according to a study from the Brookings Institution. The U.S. Department of Education estimates that more than 8 million borrowers with federal loans have defaulted on their debt, and face wage garnishment, loss of benefits, and worse credit scores, the CFPB says. Moreover, student debt can impact the chances of owning a home or accumulating wealth, according to a report from the Federal Reserve Bank of Boston. Politicians, academics, and economists widely agree that the situation is acute. But borrowers typically have few options to restructure this red ink, unlike people who find themselves under water due to credit card, business, or other personal debt. Student loan borrowers who experience financial hardship and are in default have a right under federal law to remedy their situation by enrolling in an income-driven repayment plan, according to Seth Frotman, the CFPB’s student loan ombudsman. This plan covers federal student loans, and monthly payments are based on income and family size instead of the balance outstanding. Besides providing a more affordable payment, income-driven repayment plans also allow a borrower’s remaining balance to be forgiven after qualifying payments are made for 20 or 25 years. The period for forgiveness varies, depending on the plan and other factors. Under Internal Revenue Service rules, this amount is taxable. Income-driven repayment has grown rapidly this decade. About 5.3 million people, or a quarter of all borrowers with direct loans, the largest federal student loan program in which the government is the lender, were enrolled in an income-driven repayment plan as of June 2016, compared to 10 percent in 2013, the Government Accountability Office said in a 2016 report. 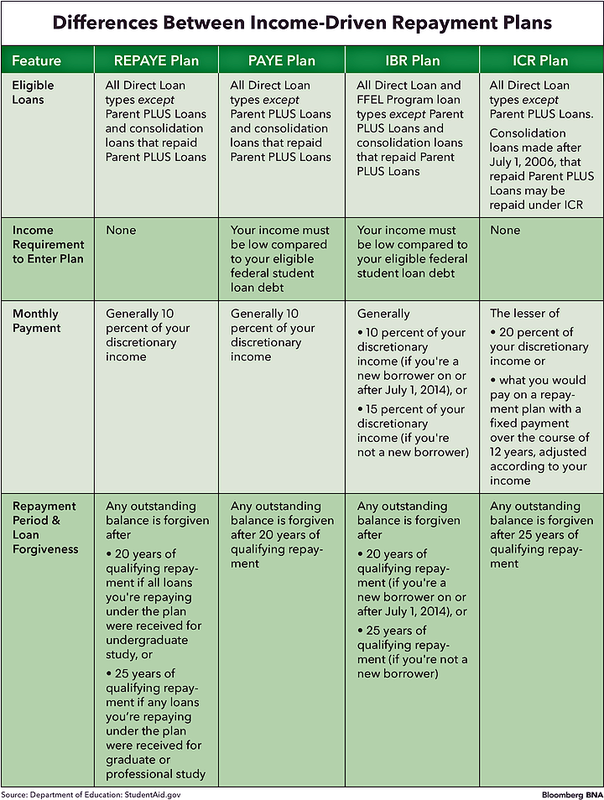 There are four income-driven repayment plans: Revised Pay As You Earn Repayment Plan (REPAYE Plan), Pay As You Earn Repayment Plan (PAYE Plan), Income-Based Repayment Plan (IBR Plan), and the Income-Contingent Repayment Plan (ICR Plan). The main difference between these plans is the formula to calculate the monthly payment and eligibility, according to the Education Department website. Many student loan borrowers would face new challenges, however, if President Donald Trump has his way. Trump recently outlined his plan in his fiscal 2018 budget proposal to streamline and cap student loan repayment, but the initiative comes with caveats. Under the proposal, there would be one income-driven repayment plan that would cap a borrower’s monthly payment at 12.5 percent of discretionary income. For undergraduate borrowers, any balance remaining after 15 years of repayment would be forgiven. But borrowers with graduate debt would get their debt forgiven after 30 years of repayment. While Trump’s proposal could provide simplification, Parent PLUS loan borrowers would lose an affordable option under his budget, Persis Yu, a staff attorney with the National Consumer Law Center’s Direct Student Loan Borrower’s Assistance Project, Boston, told Bloomberg BNA June 21. Parent PLUS Loans are those made to a parent borrower to help pay for the costs of a student’s undergraduate education. “To some extent, simplification just isn’t possible,” Yu said. “You really can’t take away plans from people who already have them,” she said. Under Trump’s proposal, Parent PLUS Loans wouldn’t be available to parents after July 1, 2018, Yu said. Parent PLUS Loans are an important option for some families when other federal loans aren’t enough to cover the cost of education, Yu explained in her blog. But Yu said she regularly hears from distressed parent PLUS borrowers because they have fewer options than other federal loan borrowers, and many end up in default. Trump’s proposed budget also would eliminate the Public Service Loan Forgiveness (PSLF) program, which allows borrowers who are repaying their direct federal student loans under an income-driven repayment plan while working full time for a public service employer to have any remaining balance forgiven after 10 years of qualifying payments. “The proposed defunding of Public Service Loan Forgiveness would be limited to borrowers taking out new student loans on or after July 1, 2018, according to the Department of Education,” Adam S. Minsky, an attorney specializing in student loan debt in Boston, told Bloomberg BNA via email June 15. Minsky, who has published a blog on Trump’s student loan proposals, said this means current borrowers enrolled in one of the income-driven repayment plans should be able to remain in that program. He said, however, that he has “major concerns about the legality of defunding the program while it still remains intact in statute.” The public service loan initiative can only be repealed by Congress, he said. “There would certainly be legal challenges if eligible borrowers are denied PSLF, since borrowers could still be legally entitled to the benefit regardless of funding as long as the program remained intact in statute,” Minsky said in his May 17 blog. Congress also must sign off on the White House spending plan that seeks deep cuts in domestic programs in return for a large boost in military spending. And lawmakers so far have reacted skeptically, so the future of Trump’s budget for the fiscal year beginning Oct. 1 is uncertain. Most courts use what’s called the Brunner test to evaluate if a borrower has shown an undue hardship, but the Eighth Circuit uses the “totality of the circumstances” test. Because many student loans aren’t dischargeable in bankruptcy, many debtors in Chapter 13 want to enroll in or stay in their income-driven repayment plans, John Rao, an attorney with the National Consumer Law Center, Boston, specializing in bankruptcy and mortgage servicing, told Bloomberg BNA June 16. There has been real tension when borrowers in default file Chapter 13 because the student loan servicer typically “puts the loan on a shelf” during the case and this has “awful consequences for consumers,” Rao said.He said there’s an Education Department regulation that places student loans in forbearance when they file for Chapter 7 bankruptcy and it lasts until the bankruptcy is concluded. That means the servicer stops collecting on the student loan debt for the three or four months the case is in bankruptcy, but interest continues to accrue.The Department of Education hasn’t issued any regulations or guidance, however, on what happens in Chapter 13 cases, Rao said. As a result, student loan servicers treat Chapter 13 filers as if they had filed Chapter 7 and put the loan in forbearance, he said. That means “borrowers can emerge from Chapter 13 further in debt because of the interest that continues to accrue on their loans for three to five years,” Rao said. In a Chapter 13, a debtor must propose a plan that uses future income to repay all or a portion of his debts over a three- to-five- year period. The Department of Education did not respond to a request for comment on its policies for Chapter 13 debtors with student loan debt. A “series of administrative, policy, and procedural hurdles may limit access to enrollment in (income-driven repayment plans) for borrowers with previously defaulted federal student loans,” according to a May 2017 update report from the CFPB student loan ombudsman.Frotman’s report said that borrowers making those kinds of payments default at lower rates than borrowers enrolled in other types of payment arrangements. Consumer advocates like Rao and Boltz, have asked the Department of Education to address this issue and have made progress. In a few cases, attorneys have been able to negotiate terms of Chapter 13 plans with the government allowing borrowers to enroll and participate in income-driven repayment plans, Rao said. This is a good first step, but “more than an ad hoc, case-by-case approach to this issue is needed,” Rao said. Most Chapter 13 filers are in a five-year plan, which means they will end up with a “lost five years” where they aren’t making any progress in their income-driven repayment programs, Boltz said. When Boltz met with Department of Education and Treasury officials, he argued that a governmental unit that operates a student grant or loan program can’t discriminate against a debtor based on Bankruptcy Code Section 525(c). By not allowing borrowers to enroll or continue in their income-driven repayment plans while in Chapter 13, the government was essentially discriminating against debtors, he said. One success story with negotiating terms of Chapter 13 plans with the Department of Education is in a case in the U.S. Bankruptcy Court for the Middle District of North Carolina. Boltz represented a debtor with more than $200,000 in debt who was able to get the court to approve an order stating that she could enroll in an income-driven repayment plan or seek a consolidation of her student loans if necessary without violating the automatic stay in bankruptcy. The court’s order specifically states that during the case, it won’t be a violation of the automatic stay to send the debtor normal monthly statements about payments due and any other communication. The Department of Education and student loan servicers said their concern was potentially violating the stay if they allowed debtors to enroll or continue in these programs, Boltz said. The order also has detailed instructions on what the debtor can and can’t do with her student loan debt. Another step in the right direction could be coming soon from the U.S. Bankruptcy Court for the Western District of Pennsylvania in Pittsburgh. That court is planning to roll out a “full blown student loan bankruptcy program for all debtors,” Boltz said. The clerk of that court didn’t reply to a request for comment on the program. In his court in South Carolina, Waites focuses on giving seminars to debtors’ attorneys to show them they have options when dealing with student loan debt. Sometimes consumer attorneys have the mistaken idea that there isn’t much they can do to help a debtor when they have significant student loan debt, he said. His court publishes guidelines on the court’s website establishing a procedure for debtor’s counsel to be paid for extra services performed to address student loan debt in Chapter 13 cases. The court recognizes that attorneys will frequently have to perform extra services when handling bankruptcy cases with student loan debt and has agreed to allow certain fees. “It’s reasonable to put provisions in a Chapter 13 plan” that relate to the student loan debt, Waites said. The Chapter 13 plan is very powerful, he said. The concept of “separate classification” to pay unsecured debt is becoming more prevalent now, Waites said. Previously, some courts have held that separately classifying long-term student loan debt unfairly discriminates. In a recent order, however, Waites concluded that a Chapter 13 plan’s separate classification of a debtor’s student loans is permissible and doesn’t unfairly discriminate. “The proposed plan promotes the policy of paying student loans and curing student loan default so the debtor can achieve a fresh start and her goals of reorganization, of obtaining employment, and of paying her creditors to the best of her ability,” he said. Talking about these issues and getting these orders out for the public to see in cases that have helped debtors deal with student loan debt will hopefully “do some good” in time to change things, Waites said.